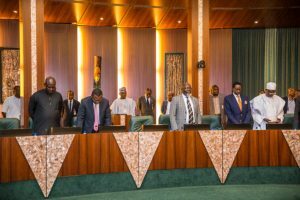 The Federal Executive Council(FEC) has approved N1.3 billion contracts to strengthen and reposition its media outfits for effective information dissemination. The media organisations to benefit from the projects include the News Agency of Nigeria (NAN), Nigeria Television Authority and Federal Radio Corporation of Nigeria (FRCN). The Minister of Information and Culture, Alhaji Lai Mohammed, disclosed this when he briefed State House Correspondents on the outcome of the meeting of the Federal Executive Council (FEC), presided over by President Muhammadu Buhari at the Presidential Villa, Abuja. He also announced sum of N148.7 million for the procurement of 15 Peugeot vehicles for the News Agency of Nigeria (NAN). He added that N873.5 million was approved for the procurement of twelve 10 Kilowatts FM transmitters and three Outside Broadcast Vans for the Federal Radio Corporation of Nigeria (FRCN). “So also the News Agency of Nigeria also presented their memo. But, here largely they wanted vehicles to enable them move to gather and disseminate news.